For Immediate Release: Posted On 9/25/2013 By Industrial Magnetics, Inc.
Industrial Magnetics, Inc. recently announced that their line of magnetic welding squares, used to hold steel sheet, plate or tubing during the welding process, is now being produced in the United States at their Michigan facility. Along with moving the production back on-shore, various product improvements were made based on customer feedback while maintaining the same price as the previous imported models. 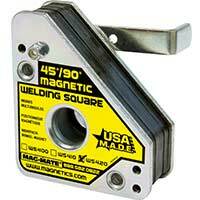 The revised welding squares feature a stronger magnetic holding force and include a large finger hole for easy setup and removal. Standard through-holes allow for easy mounting and fixturing and the new plated vs. painted steel poles maintain a clean, non- rust surface. Select models also feature covered magnets to reduce fuzz iron build-up and "brake-away" handles for easier removal after welding. States IMI’s Strategic Accounts Manager, Peter Friedrich, "We are really excited to be offering an American made product for the North American worker. Manufacturing this product in-house gave us the design control we needed to better respond to our customer’s requests."